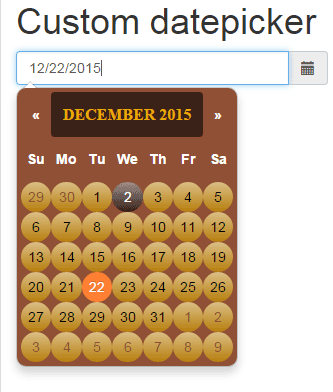 Unlike many other add-ons, the datetime picker is not provided in the Bootstrap framework. In order to use datepicker, you may use jQuery UI based datepicker widget, as such in your web projects based at Bootstrap, you generally have jQuery library included. 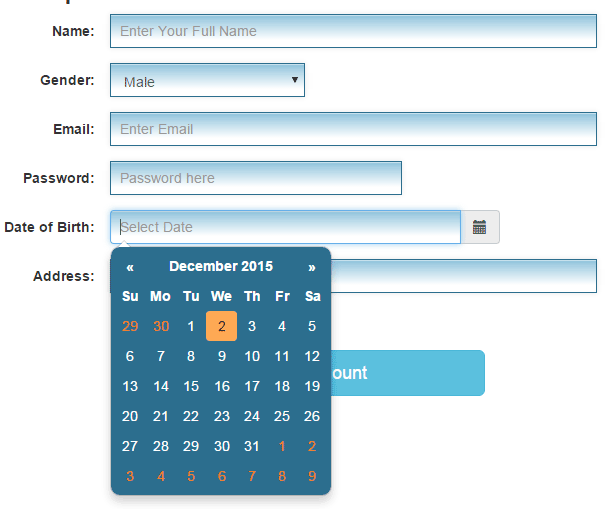 In that case, you only need to include the jQuery UI library that has datepicker component. This can be customized as per needs of your website. A guide to set this up is written here. The other way is to use third party plug-ins that are based at Bootstrap framework. 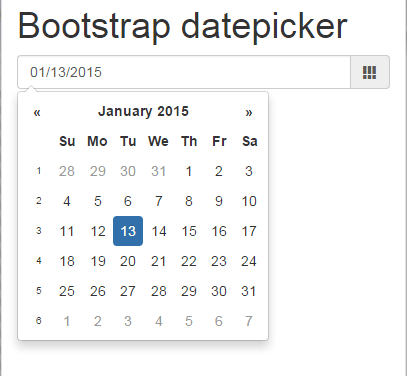 This tutorial is a step by step guide to set up Bootstrap datepicker. 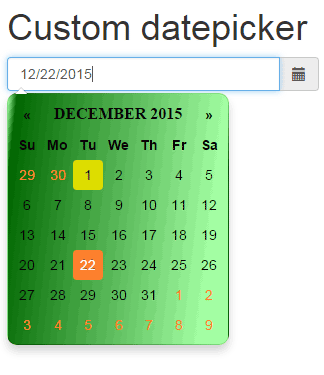 The datepicker plug-in name is bootstrap-datepicker, which is a fork of Stefan Petre and is enhanced and maintained by semvar (source links are given at the bottom). Before setting up this plug-in, have a look at a few demos online to see how it looks, stand-alone and in Bootstrap forms with other form controls. 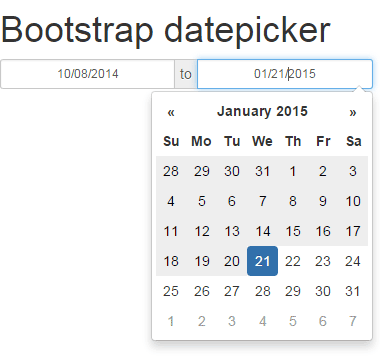 In all above datepicker examples, I have used bootstrap-datepicker plug-in. As mentioned earlier, this is a third party plug-in that needs to be installed or set up in order to get it working. The plug-in site says its requirement is Bootstrap 2.0.4+. I have tested it with the latest version as well, Bootstrap 3.3.5, and it is working there as well. These are the required files that contain plug-in and style. Include these after the Bootstrap and jQuery libraries. You may get these libraries here: CDN link or find it in GitHub site. That’s it as far as including libraries are concerned to make it work. See the <script> part in example codes to call the date picker as you click in the textbox or icon. You have to call datepicker by textbox ID, class, or name. Just replace it with the ID of your textbox that is associated with the calendar. In all above example, you might have noticed the datepicker or calendar is using the same style, which is the default. In professional websites, you may also need to change the look and feel of the date picker to match the theme of your website. The following section describes it, how! In order to change the look of the calendar, you have to change the colors or other CSS in that file. You may either download this file, amend it as per need and host it at your own OR select the required CSS classes that need to be changed and override the default. In that demo, a few classes from the bootstrap-datepicker3 are taken that affect the color of whole datepicker, the hover state of month/year bar, hover class for days as you bring the mouse over it and current day class. For the demo, I have placed these classes in the head section after the bootstrap-datepicker3.min.css file. 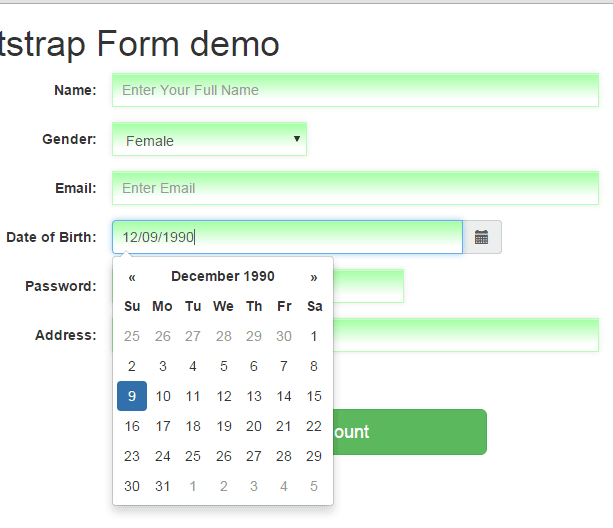 The following demo is another datepicker that is using the Bootstrap-datepicker plug-in with a few CSS3 properties. The classes are placed in the head section that overrides the default classes. In this demo, I simply used a linear gradient background in the main datepicker-dropdown class. Besides, to match the colors of days, active day, current day, and hover states, a few changes are made in above mentioned classes. In this example, bordered days are presented with linear-gradient along with changing the color scheme of the datepicker. The only difference to above example is border-radius: 50%. The style section contains the custom CSS class for the controls as well as selected classes of the datepicker’s CSS classes that override the default styles. What about customizing range datepicker? Similarly, if you need to modify the date range datepicker styles, it has a different set of classes in the same CSS file. Just go through it and you will find it easily with the range prefix. Copy those classes from that CSS file and bring it in the styles section of head tag OR use an external CSS file. In any case, you must refer that style after including the bootstrap-datepicker3.min.css file. (or if you are using less or another format). 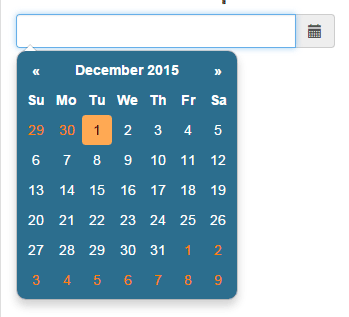 By using this link, you can set up the datepicker functionality by using an online wizard. It will automatically generate the code for the jQuery section (in the head) and markup that you can use in your website. 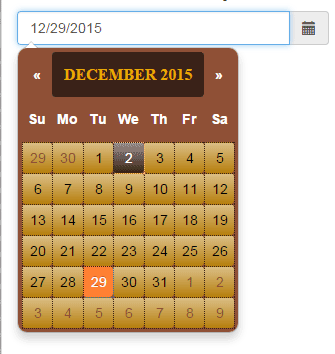 For example, the datepicker should be auto-close or not, as a user clicks on a day. Including keyboard navigation, setting date format, Calendar Weeks, and many other options can be set up by selecting or unselecting options.